One could spend several paragraphs detailing the litany of ways in which Arrow fumbled through its third year. What’s important to keep in mind, however, is that while the show stumbled, it never fully fell down. For every miscalculated plot thread (i.e. Oliver and Felicity’s frustrating on-again-off-again relationship, the dull League storyline that concluded the year) there were some fantastic elements introduced as well (Brandon Routh’s A.T.O.M). And though the season’s issues were all reflected in the finale, that episode also set the stage for the series to reboot itself and start over with a clean slate. If “Green Arrow” is to be believed, the creative team is working hard to course correct back to the glory days of Season Two. Per its title, the episode finds Oliver making his way to a new identity in the wake of The Arrow’s “demise” last season. How he arrives at this point is the interesting portion. The season begins, as many seasons have before it, with Oliver darting through a wooded area. In this instance, however, the woods are merely the outer area of a stereotypical idyllic suburban neighborhood where he and Felicity now reside. As Felicity fights for control of Ray Palmer’s company, Oliver is content to play house husband, diving headfirst into the wonders of cooking and prepping brunch with the two’s whitebread neighbors. In a welcome reversal of the standard gender roles, we later learn that Oliver has embraced his new, tranquil lifestyle, whereas Felicity misses the thrill of their superhero-ing days. Back home, Team Arrow—now consisting of Diggle (with a snazzy new Magneto-esque helmet), Laurel’s Black Canary and Thea’s Speedy (though she demands to be called Red Arrow)—find themselves battling a new breed of criminals who the authorities have dubbed “the ghosts.” The name is well founded,given that they have mastered the art of committing robberies and subsequently disappearing without a trace. Their mastermind is soon revealed to be Damien Darhk, the League member who, according to Ra’s, splintered off from the group to pursue his own interests. Darhk is here played by character actor Neal McDonough, who makes his grand entrance during a meeting of the Starling City Council. As an actor, McDonough has always thrived as portraying the kind of characters who could switch from classy, dapper men in suits to frightful, violent brutes in the blink of an eye (see Boomtown and Justified). The Arrow writers are clearly familiar with the man’s resume, as that is exactly the role he is made to fill here. In his opening scene, he smiles and jokes to the confused Council members before buttoning his visit with a threatening goodbye. And the man is true to his word—a few scenes later, every member save for Lance (who is rescued by Laurel last minute) meets a gruesome fate. Already Darhk is a major improvement over Matt Nable’s underplayed Ra’s, who occasionally displayed the gravitas of an ancient warrior, but never really felt like much of an imposing, legitimate threat. McDonough, on the other hand, bleeds menace and charisma. He’s just the shot in the arm the series needs after last season. Indeed, Oliver’s (reluctant) return to Starling City puts him face-to-face with the ghosts of his past mistakes. Upon entering the city limits and seeing the rows and rows of dilapidated houses, Oliver can’t help but wonder aloud if the team’s efforts over the past three years accomplished anything. Likewise, besides the situation with Diggle, Oliver is also horrified to find Thea taking perhaps a bit too much pleasure in exacting justice, much like Oliver himself did in the first half of Season One. Between this and Diggle’s comment, one gets the sense that much of the year will center on Oliver facing the dark part of his soul that he’s managed to keep repressed for the past few years. Also returning are the ever-divisive flashbacks. Look, I’ve made no secret of my distaste for last year’s Hong Kong scenes, as they never really added up to much and effectively worked to undermine the momentum of the present-day stories. At this point, the technique feels like a relic of the first two seasons, which actually fed into the series in an intriguing way by exploring the evolution of Slade Wilson into Deathstroke. Now, with the advent of so many characters and a fleshed-out world that includes metahumans and mystical forces, the flashbacks just seems like one more plate that the show doesn’t need to be spinning. Anyway, this year’s batch seems to involve Oliver being sent back to the island by Amanda Waller to infiltrate some kind of operation that is based there. You’d think after the blow-up in Season Two that any nefarious organizations would be hesitant to make that island their headquarters, but whatever. As of now, the flashbacks were short enough that it’s not fair to pass judgment on them just yet. In the present day, Team Arrow discovers that Darhk and his cronies are planning to place explosives on a train, setting the explosion for once it hits the station. 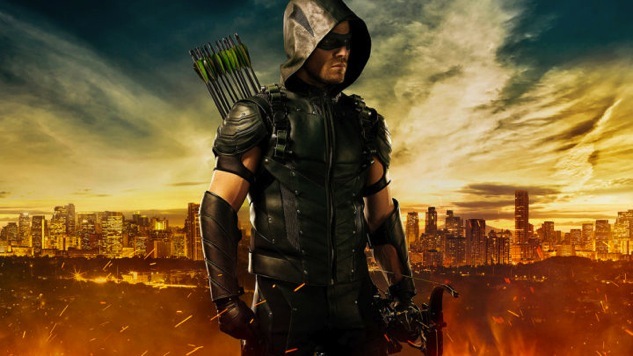 Oliver, equipped in his all-new, more green-tinged get-up, manages to stop the train, but not before discovering that, in addition to being able to kill someone with a touch (as he demonstrated on a henchman earlier in the episode), Darhk also boasts the ability to make arrows stop in mid-air. As the episode careens towards its final few minutes, we are treated to two major surprises that will no doubt play out in the installments to come. One, we learn that Quentin Lance is somehow under Darhk’s thumb. Second, the episode ends with a flashforward to six months later, where a stone-faced Oliver stands in a cemetery and stares at a particular tombstone. Barry Allen arrives for a brief cameo to pay his respects and offer comfort to the grieving Oliver, but it’s of no use—Oliver is on a warpath. The episode ends before we see the name on the tombstone, meaning that the identity of the deceased is likely to be an ongoing mystery for the season—Felicity? Diggle? Laurel? Quentin? All are possibilities, although the show does cut to this moment directly after a cute scene where Oliver and Felicity embrace and Felicity comments that he doesn’t need to carry around a darkness to be an effective hero. Here’s hoping that this is not an indication that the writers are willing to kill off perhaps the show’s most beloved character to return Oliver to his Season One status, but we shall see. Death has never been a permanent fixture of superhero lore anyway, so who’s to even say that whatever tragedy did occur isn’t reversible? “Green Arrow” provides a thrilling dive back into the Arrow world. Between an exciting new villain and a whole new batch of mysteries, the season already looks to be on a positive trajectory. Here’s hoping, unlike Oliver’s arrows, it doesn’t get stuck and fall midway through.